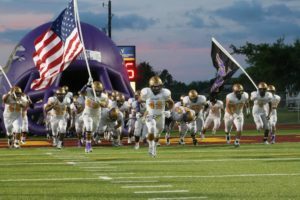 “Winners never quit and quitters never win.” Although that is a direct quote from one of the greatest to ever coach the game of football, Vince Lombardi, It was the type of mindset that the San Benito Greyhounds played with Friday night. 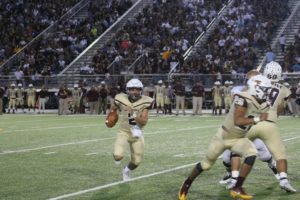 The Los Fresnos Falcons hosted the Greyhounds in their 32-6A district season opener and the stands were jam-packed, filled with tons of support from both sides. 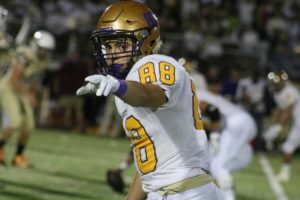 San Benito entered the game seeking revenge from last year’s loss and Los Fresnos was trying to get back on track after suffering their first loss of the season last week. In the end, it was the ’Hounds that were able to rally early and hold on late for a 34-26 victory. San Benito received the ball to start the game. In the first 9 seconds, however, the Falcons managed to force a fumble and recover the ball inside Greyhound territory. Next possession, an 18-yd TD by the Falcon’s running back, John Salazar, gave The Falcons the upper hand, making it 7-0. With the Hounds offense on the field, costly mistakes prevented them from driving the field. Falcon’s forced a quick 3-and-out and regained position. Salazar capitalized on a 63-yard TD run, bringing the score to 13-0; Falcon’s 2-point conversion was unsuccessful. Greyhounds kick returner, Danny Zuinga, gave life to the team, running the ball to the Falcon’s 30-yard line. QB Erick Retta threw his first TD of the night, a 20-yard pass to #11, Isaiah Trevino. Greyhound’s special team’s unit added points to the board on a 28-yard field goal, bring the 1st quarter to an end with the Falcons ahead, 13-10. With the 2nd quarter underway, Falcon offense failed to gain momentum and were forced to punt the ball. Retta found another target in the end-zone, a 25-yard pass to #88, Tyler Solis to make the score 17-13. The Falcons answered quickly with a 9-yard pitch-and-catch in the end-zone, bringing it to 20-17. Greyhound’s offensive unit got the ball rolling, finding the end-zone before halftime. Retta linked up with Trevino for a 50-yard TD play, bringing the half to an end. Greyhounds closed out the 1st half with the lead, 24-20. Falcon’s received the ball 2nd half of the game. On a 4th & 3, Falcon’s managed to pull some trickery and find the end-zone on a 63-yard TD play. The 2-point conversion was good, making it 26-24. Retta and the offensive unit took the field. Costly mistake caused Retta to throw his only interception of the game; Falcons returned the ball to the Hounds 29-yard line. Greyhounds got the ball back and was able to get the offense rolling. Marcelino Morales pounded his way into the end-zone for a 2-yard TD. San Benito ended the 3rd quarter with the lead, 31-26. The Falc ons were gaining some ground, beginning of the 4th quarter, driving the ball into Greyhound territory. On a crucial 4th & 3, a troubled snap by the Falcons O-line caused the Greyhounds to regain possession. On a 4th and 16, an unsportsmanlike conduct was called against the Falcons, giving San Benito an automatic first down. Unable to drive the ball down the field, the Hounds were forced to punt. Unable to properly secure the punt, Falcons Special Teams unit turned the ball over on their own 8-yard line. A Greyhound 5-yard field goal sealed the deal, making the final score 34-26. 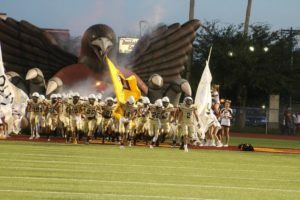 The Greyhounds will host Weslaco East Wildcats at Bobby Morrow Stadium on Friday, September 30, 2016 @ 7:30pm.